LANDMARK WESTERN SERIES FROM THE CREATORS OF "GUNSMOKE" TO DVD FOR THE VERY FIRST TIME! The Cimarron Strip, the border region between the Kansas Territory and Indian Territory, was a dangerous place in the late 19th century, and it was up to one man to keep the peace: the tough-as-nails U.S. Marshal Jim Crown (Stuart Whitman). 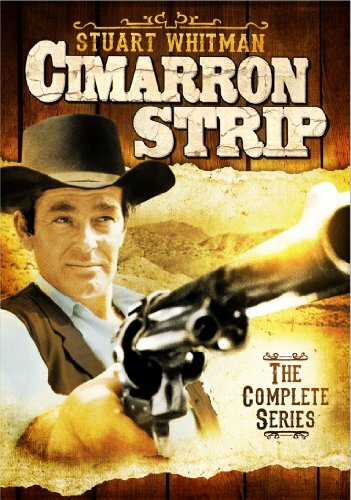 Cimarron Strip: Complete Series makes its DVD debut this May in a collector's set including all 23 feature-length episodes - over 27 hours of classic Western action - on 8 DVDs. Airing on CBS from September 1967 to March of 1968, the series was produced by the creators of "Gunsmoke", and was one of only three 90-minute weekly Western series that aired during the 1960s (the others are "The Virginian" and, for one season, "Wagon Train") and the only 90-minute series of any kind to be centered primarily around one lead character. Set in 1888 as the frontier was closing, U.S. Marshall Crown was assigned to protect Cimarron and surrounding areas, following a stint cleaning up Abilene. Arriving to find that the local sheriff had resigned, it falls upon Crown to keep law and order in a lawless land. With a star turn by Whitman, a memorable theme from Oscar(R)-winning composer Maurice Jarre (multiple Academy Award(R) nominee and winner for Doctor Zhivago, A Passage to India) and guest stars including Beau Bridges, David Carradine, Seymour Cassel, Joseph Cotton, Robert Duvall, Victor French, Mariette Hartley, Darren McGavin, Leslie Nielsen, Warren Oates, Slim Pickens, Suzanne Pleshette, Denver Pyle, Telly Savalas, John Saxon, Tom Skerrit, Harry Dean Stanton, Jon Voight, Tuesday Weld and many more, it's a series that will forever be remembered as one of the 60s classic TV Westerns.